Faithful from parishes and villages across Alaska and the dioceses of the Orthodox Church in America began arriving early at the spacious Saint Innocent Cathedral here on the morning of Friday, February 21, 2014 for the celebration of the Hierarchical Divine Liturgy, during which Bishop-Elect David [Mahaffey] was consecrated to the episcopacy as Bishop of Sitka and Alaska. Over forty priests and deacons joined His Eminence, Archbishop Benjamin; His Grace, Bishop Michael; His Grace, Bishop Ireneu; and His Grace, Bishop Irénée in welcoming His Beatitude, Metropolitan Tikhon at the cathedral entrance. Joining them were the Chancellor of the Orthodox Church in America, Archpriest John Jillions and the Chancellor of the Diocese of Alaska, Archpriest Victor Nick. Also present were Bishop-Elect David’s children, their spouses, and his granddaughter. At the outset of the Liturgy, Father Jillions and Archdeacon Kirill Sokolov brought Bishop-Elect David before Metropolitan Tikhon and the bishops, seated in the center of the cathedral, where he read the Nicene-Constantinopolitan Creed, followed by a detailed explanation of the Church’s Trinitarian and Christological doctrines. He then read his personal commitment to uphold the Church’s canons and the teachings of the Holy Fathers and to preserve unity with his brother bishops. 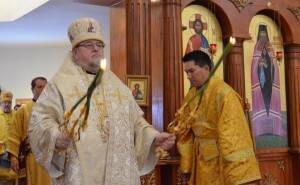 During the Divine Liturgy, Bishop David ordained Deacon Symeon Askoak to the priesthood. Newly ordained Father Symeon is from the village of Russian Mission and will be completing his studies at Saint Herman Seminary in May. At the conclusion of the Divine Liturgy, Metropolitan Tikhon and the consecrating bishops, along with the clergy and faithful, venerated the Cross and greeted His Grace, Bishop David. The cathedral thundered with the singing of “Many years, O Master,” after which the clergy and faithful joyously sang traditional hymns in Yupik and Slavonic until everyone had the opportunity to receive Bishop David’s blessing and offer their personal congratulations. Metropolitan Tikhon delivered the homily and offered an exhortation to Bishop David as he presented the newly consecrated bishop with the archpastoral staff. The texts of his homily and exhortation appear in their entirety below. A photo gallery of the Divine Liturgy may be found on the OCA web siteand Facebook page. Updates and additional galleries will be posted as they are received. My dear brothers and sisters in Christ, today is a day of great rejoicing for the Diocese of Alaska as we gather in this sacred Cathedral of Saint Innocent to participate in and witness the ordination of the Right Reverend David as the new Bishop for this diocese, the Mother Diocese of the Orthodox Church in America—the diocese which guards the relics, the teachings and the examples of so many of the inspired and great saints of North America. At the same time, having entered into the period of the Lenten Triodion, we find ourselves in that time of the Church’s liturgical calendar during which we prepare ourselves to enter the season of Great Lent. As happens each year, the appointed scripture readings for the days preceding the Sunday of Forgiveness take us through the Gospel account of the Passion and Death of our Lord and Savior, Jesus Christ. And so, in today’s Gospel reading, we have walked with our Lord to Golgotha, the place of a skull, where He was given wine mingled with myrrh to drink, where His garments were divided and lots cast, where He was crucified on the Cross and where, after having cried out with a loud voice, He breathed His last. So we have today both a reminder of the Passion and Death of Christ and an expression of His divine love, through which He has saved us. This is indeed fitting for this day in the life of the Diocese of Alaska and in the life of the newly ordained Bishop David because, as we know so well and as we sing so often in the Church, “through the Cross joy has come into all the world.” Today, Bishop David and the clergy and faithful of this diocese receive the joy of the fullness of the Church: a bishop elected and appointed to be the Archpastor and High Priest to safeguard the unity, identity, integrity, unanimity, continuity, solidarity and harmony of the churches of this diocese. And yet the joy of the Lord was present in them, waiting to be released by the news of the third day Resurrection which would make clear to them that their Paschal joy was made possible through the pain and sorrow of the Cross. The intimate connection between the Cross and joy works both ways: Joy preserves us in the midst of the sorrow and temptations of life, while the Cross preserves our sobriety when we are filled with joy. And so it is today, on this day of the Consecration of Bishop David, on this day in which the Diocese of Alaska receives a new shepherd, a new father, that our joy is also made stronger by the remembrance of the Cross and Death of our Lord and Savior Jesus Christ, through which life and resurrection have been given to all of us. It is the Bishop who, above all, is given this sacred task of guiding his flock to abide in the doctrine of Christ and to preserve the Truth of this doctrine through love, just as Saint John “loves in truth” the elect lady to whom he addresses his epistle. The Bishop offers his love to his clergy and his flock, just as he is supported by their prayers and their love for him. The joy we feel today should be an inspiration for all of us, an inspiration to bear with courage the crosses that are placed upon us, to love one another and, as Saint Herman so piercingly reminds us, to love God above all every day, every hour and every minute. May our Lord Jesus Christ, Who is going to His voluntary Passion in the flesh, strengthen us, encourage us and fill us with His love, so that we may walk with Him to the light of the Resurrection, the joy of life eternal, and the glory of the heavenly Kingdom. Amen. It is a great blessing for all of us to be gathered here, from near and far, for this joyous event, to have served with so many clergy from the Diocese of Alaska, together with the faithful of the region, and to welcome the clergy and faithful of many of the dioceses of the Orthodox Church in America and other jurisdictions. I am grateful to the members of the Holy Synod who have concelebrated with us today: His Grace, Bishop Michael of New York and the Diocese of New York and New Jersey; His Grace, Bishop Irénée of Quebec City, Administrator of the Archdiocese of Canada; and His Grace, Bishop Ireneu, of Dearborn Heights. Especially, I would like to express, on behalf of the Holy Synod of Bishops, their sincere thanks to His Eminence, Archbishop Benjamin, who has labored sacrificially and with great love for the clergy and people of Alaska during his time as Locum Tenens. I am sure that I speak for all the clergy and the faithful in expressing the deep appreciation for his willingness to serve, to bring the diocese to a place of stability and solidity, to a place where today’s event, the Consecration of a new father and Archpastor, Bishop David, was made possible. To His Grace, the newly consecrated Bishop David, I offer these few words on behalf of the Holy Synod and all the clergy, monastics and faithful of the Orthodox Church in America: I wholeheartedly congratulate you on your consecration and enthronement as the ruling Bishop of the See of Sitka, and the Diocese of Alaska. Through the mystery of the All-Holy Spirit and the laying on of hands, our Lord has bestowed on Your Grace the apostolic grace to strengthen you in your Episcopal labors. Your election and consecration come at a time when the faithful of Alaska are in great need of a good pastor and capable shepherd who knows his people, and is known by them. There is much to do in this land, which received the Word of our God through the great missionary saints Innocent and Herman, and their companions, and through the sacrificial examples of the martyrs who shed their blood in this land. Chief amongst your concerns must be the training of young men and women who will become the future of the Orthodox Church here in Alaska, so that the love and missionary zeal of the entire Church may be kindled anew. My dear brother, I pray that Our Lord will grant you good health and the plentitude of spiritual gifts so that you may, in peace and love, nourish the People of God and be a witness to all who are searching and seeking for the Truth as offered by our Lord and Savior Jesus Christ. From my heart I wish you inexhaustible energy, peace and joy as you undertake this awesome ministry as a Bishop of Christ’s Church. To the clergy, especially the newly-ordained Priest Symeon, we offer our congratulations and deep gratitude for the great number of you who have come here today to serve with us and to participate in this great event. I exhort you to prayerfully and lovingly offer your love, support and encouragement to your new Archpastor, and to learn from him as he leads you and guides you in your pastoral ministries. To the faithful of the diocese, I also ask you to offer your prayers for Bishop David, so that his ministry might truly bear fruit a hundredfold and that he, working together with all his clergy, may lead all of you in the direction of the heavenly Kingdom and into the glory of God.